Wow, It's been such a long time since I posted anything. I'm just in time for the Gradient challenge over at MoxieFabWorld. Cath has extended the deadline until October 12, so you've all got just a wee while longer. There's lots of great work up so do check it out. 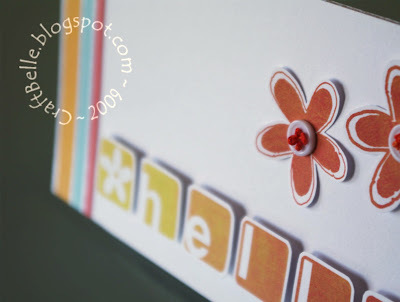 Okay, I wanted to keep this card clean and simple and I was thinking about using geometric shapes or tiles for stepping out the colour change when I came across these Alpha blocks by Katie Pertiet over at Designer Digitals. They looked just like my doodle and were ready to go. 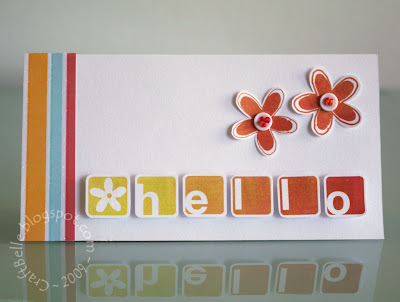 So, I spelt out "Hello" to create a sentiment and graphic in one - yeah! Next, I selected a colour change of yellow to a burnt orange, which I think sits nicely with Autumn as well as for spring here in OZ. I made a gradual change in the shade of paper (Jesse Edwards) of each block to make the gradient. And then cut and popped them up with foam pads. Finally I added some Frangipani inspired flowers (an altered K Petiert graphic), buttons, French knots and lifted the corners to add a little dimension. Wow this is fabulous! Way to go! Ohh...love love love this! So crisp.